Traces of past suffering are all around, but noting them and then responding to them are complex and uncertain tasks. 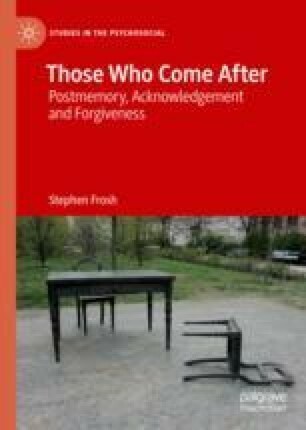 Much of this book is concerned with problems of registering, recognising and acknowledging these traces, especially when one is caught up in them in some way, as a co-sufferer perhaps, or more likely as a witness, or even as someone who is directly or indirectly implicated in the cause of the suffering. One step in all this is for the suffering itself to gain expression; that is, for there to be a form in which the ‘voice’ of suffering can be made loud and clear enough for the need for a response to become undeniable. Speaking out is not exactly the necessary first step, however, in that it could be argued that an ethical approach to listening requires the witness to take the initiative, as writers from Emmanuel Levinas to Jessica Benjamin with their various uses of the apparently opposite formations ‘after you’ or ‘I’ll go first’ imply (Levinas 1985; Benjamin 2004; Frosh 2009). For these writers, the ethical imperative is to act independently of the other’s demand; that is, to take responsibility for acting in the light of the other’s need, whatever that other might do or might represent. Benjamin is different from Levinas on exactly what this means, more focused on reciprocity and joint or mutual subjectivity; but the two positions are aligned in assuming that being an ethical subject means knowing that you cannot avoid taking responsibility for another’s suffering by saying that they haven’t actually asked for help. Singer, I. B. (1978). Isaac Bashevis Singer’s Speech at the Nobel Banquet. https://www.nobelprize.org/prizes/literature/1978/singer/speech/. Accessed 30 Dec 2018.